Some people collect miniature spoons, or porcelain thimbles when they go on vacation. Others collect magnets or key chains or tiny, personalized license plates. I try my darnedest not to collect tschotchkes, but I still want something to remember my vacations by. So, I’ve started collecting something that I think you guys could get behind. The yarn must be spun, died, or both by a local yarn producer. One skein must be enough to make a complete project. This means that 95% of my Vacation Yarn ends up being sock yarn. But that’s great, because now I’ve got a bunch of pairs of Vacation Socks! We just got back from a trip to Lake Tahoe, down in California (which is lovely by the way. I highly recommend going in October- It’s practically empty, the weather is perfect for taking long walks along the lake or sitting in the sun with a cup of tea and some knitting. And when the weather’s not perfect, it’s a great time to go inside and play board games with your buddies). 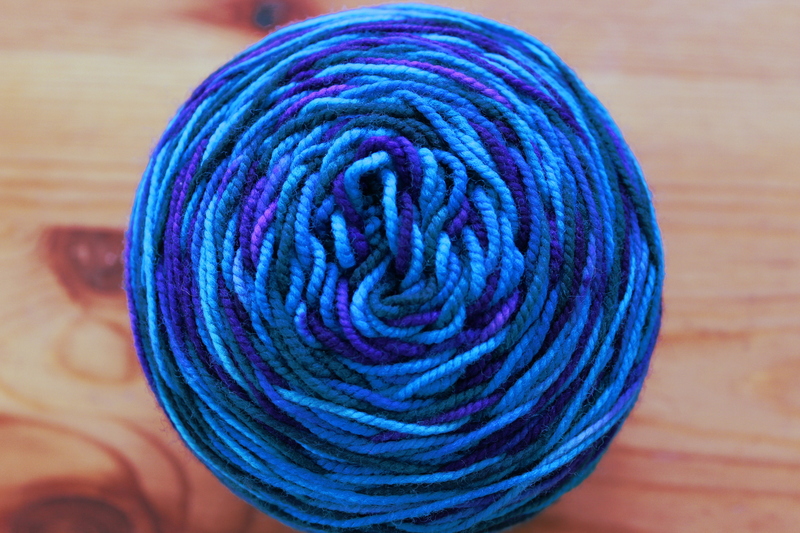 And, of course I got a skein of Vacation Yarn. 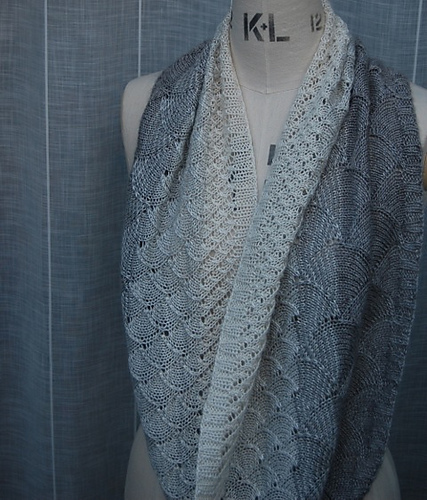 It’s from a very cute little shop in South Lake Tahoe, Knits and Knots Tahoe, and was hand dyed in the area. This sock yarn was dyed in a colorway called “Driftwood” and it’s a lovely brown-y olive, with little speckles of dark brown and a splash of bright leaf green. It really reminded me of the colors of the area- the soft brown of the dead pine needles that cover the ground under the massive pine trees, and the green of the little plants peeking through the forest floor. 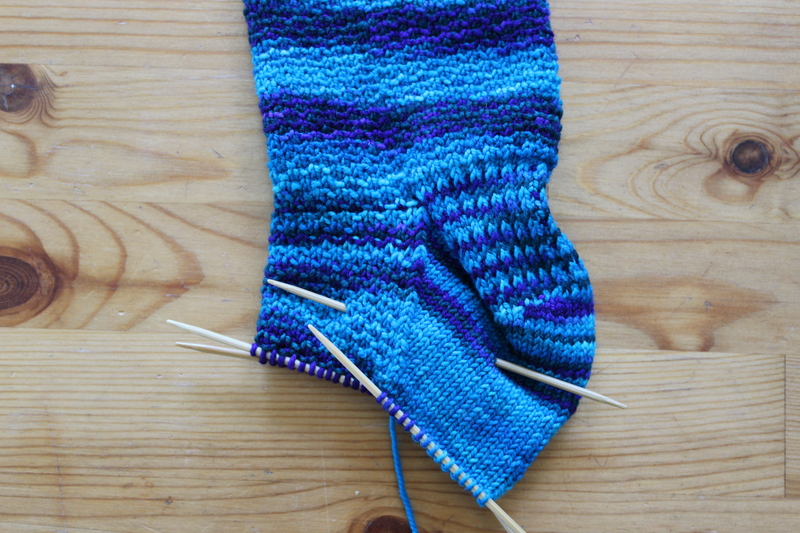 I can’t wait until I have time to knit up my Lake Tahoe Socks! What do you collect when you’re on vacation? This entry was posted in FYI and tagged sock yarn, vacation, vacation knitting, vacation yarn on October 15, 2018 by onemilljellybeans. But, this time I am pleasantly surprised. Somehow, the pooling on this sock worked out really well! 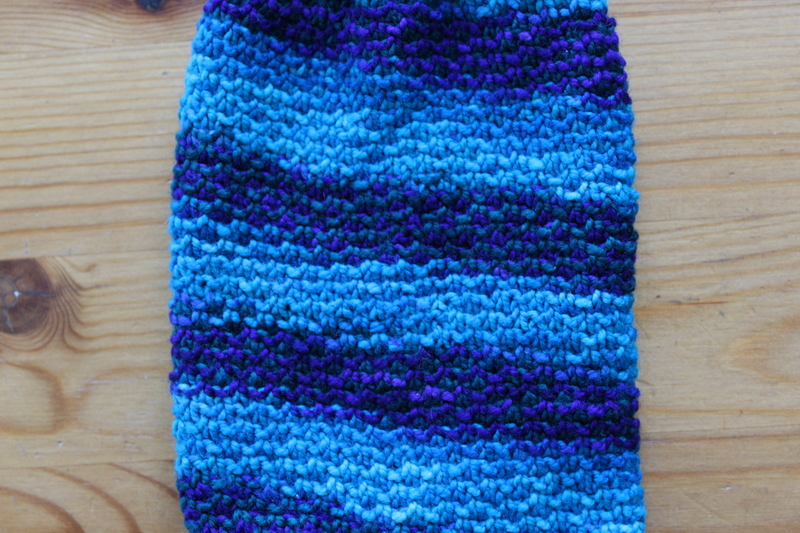 It’s turned into a pretty blue-and-purple spiral, zooming down the broken seed stitch leg. Unfortunately, the heel has messed up the perfect spiral pattern. Dang. Hopefully the spiral will come back as I make my way further down the foot. (And hopefully I can get the other sock to match!) Fingers crossed! 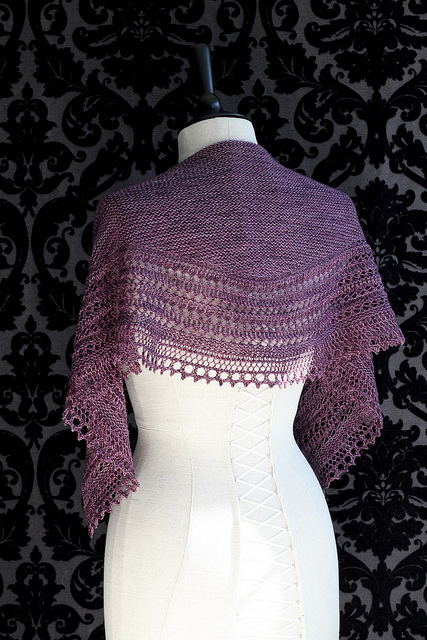 Have you ever been surprised with how a new yarn works up? This entry was posted in On My Needles and tagged pooling, sock, sock yarn, variegated, yarn on July 16, 2018 by onemilljellybeans. I’ll be honest with you, it’s been a rough couple days at my house. I’ve come down with the plague, or as my doctor put it “just” a cold. I’ve been a coughing, sniffling mess. My house feels full of Kleenex and I’ve been drinking water like it’s going out of style. It’s the worst! 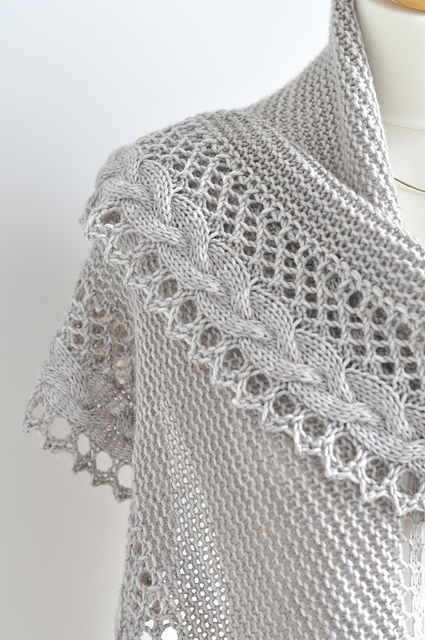 I haven’t had the brain power to do any planning on my Ravellenic Games knitting, so I guess we’ll all be surprised with what I decide to do, come Friday morning. I haven’t been able to muster the energy (or the brain power) for doing anything more than simple knitting-and only knitting. No purling, no shaping, no counting. I don’t want to leave the house to get more yarn (because I don’t want to spread this plague to anyone else), so into the stash I went. And lucky for me, I found a ton of single skeins, half-skeins, and tiny balls of sock yarn. I have a vague memory of going crazy a couple years back and getting 20 or so skeins of Knit Picks Stroll during one of their sales. I’ve been slowly working through it, but there’s still quite a bit leftover, and not really enough of any one color to make a full pair of socks. And, that’s exactly what I’ve been doing. I’ve cast on a bunch of stitches (I didn’t count, but it’s about a yard’s worth of stitches- I’m sick! Give me a break!) with some nice big US10s, and I’ve been knitting back and forth, watching crummy daytime TV for the last couple days. And whenever I get bored of a color, or when a skein runs out, I switch that strand for a different color. So far, I gotta say, I like how it looks! Plus, it’s crazy simple, and I’m cruising through really quickly. 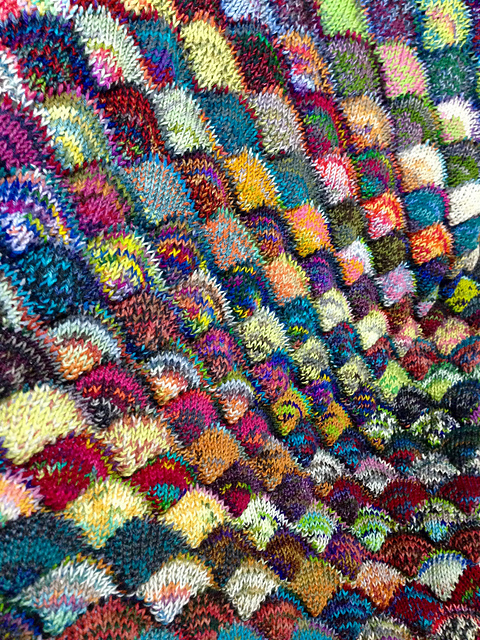 It’s going to be a really nice, cozy blanket! What do you like working on when you’re feeling under the weather? This entry was posted in On My Needles and tagged baby blanket, blanket, garter stitch, kniting, sock yarn on February 7, 2018 by onemilljellybeans. But, when you knit your socks, you magically end up with beautifully striped socks with absolutely no effort on your part! So, how do they do it? 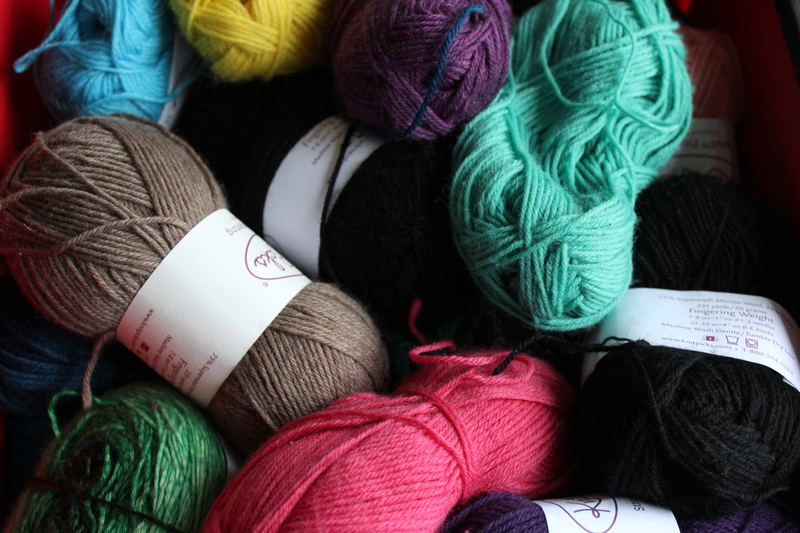 Basically the yarn company figures out how much yarn the average knitter uses for every row when she makes her socks. 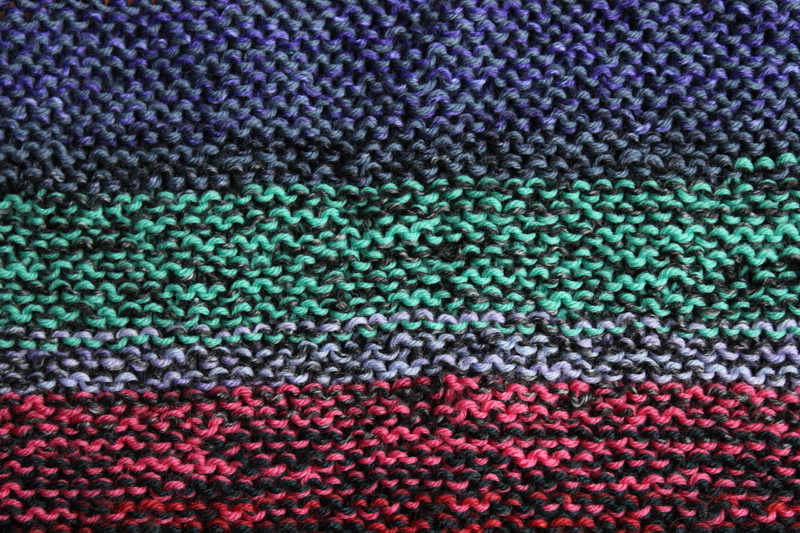 Then, they dye the yarn in row-long increments, so that each row is a different color. So, for example, if it takes 1 yard of yarn to knit 1 row, they might dye the yarn sow that 5 yards are blue, then 5 yards are green. 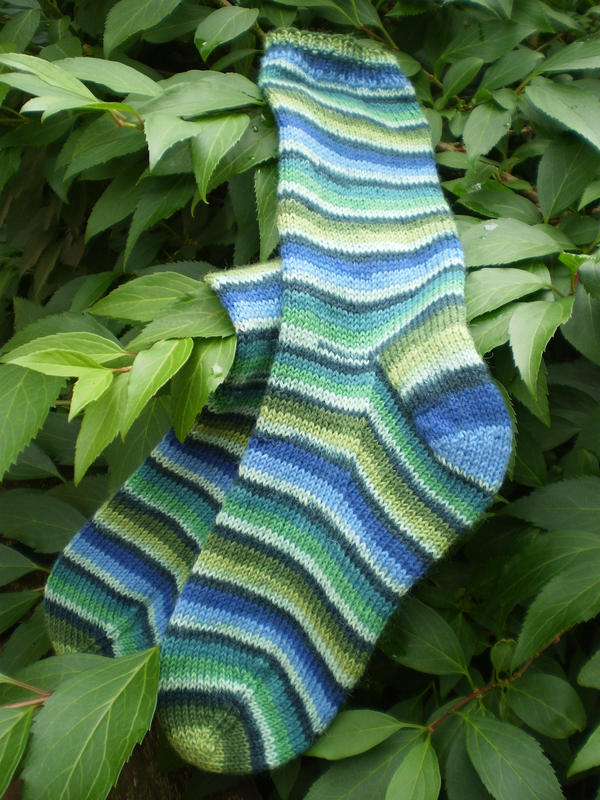 This means that in the finished sock, you will end up with a 5 row stripe of blue followed by a 5 row stripe of green. Pretty clever! 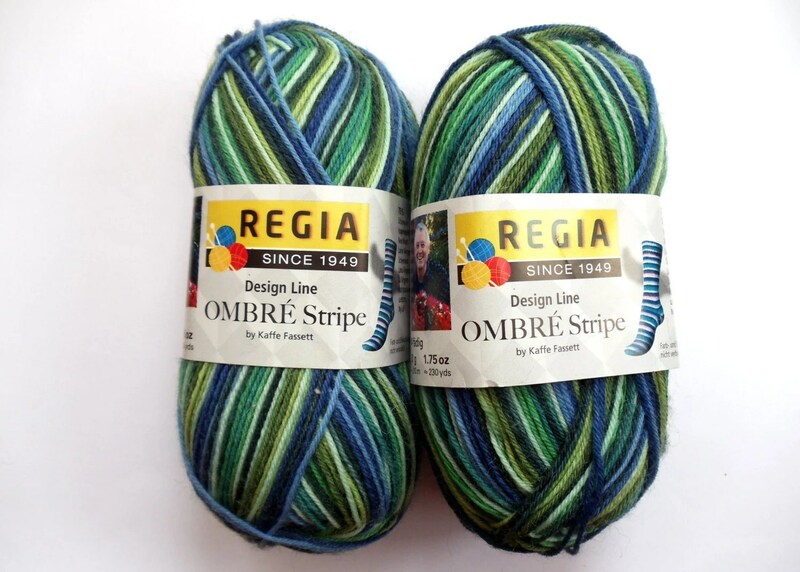 This entry was posted in FYI and tagged knitting, self striping sock yarn, sock, sock yarn, stripes, yarn on June 21, 2013 by onemilljellybeans. If the sun’s out in Seattle, you’re pretty much required by law to spend your day outside. 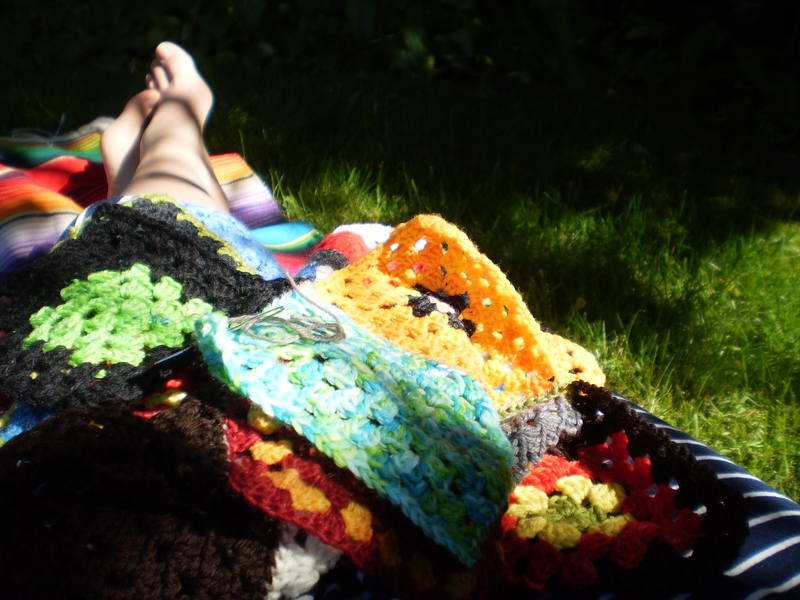 So, I decided to sit out in the yard with a nice iced coffee and a pile of granny squares and sew them together. Not a bad afternoon. They’re nowhere near an entire blanket yet, but they’re a start. 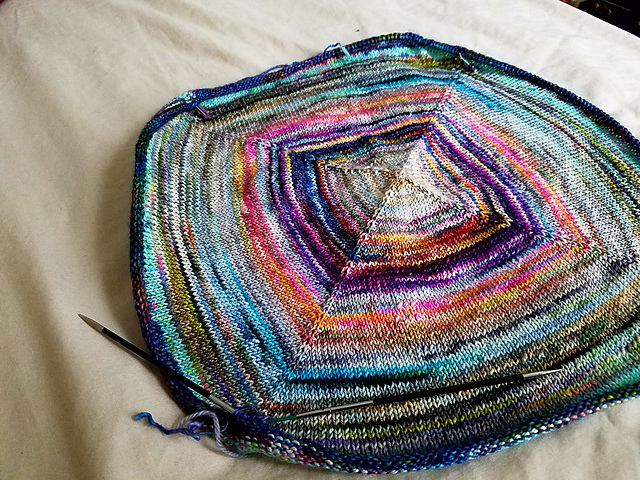 It’s going to end up being possibly the tackiest blanket ever (since I’m using up all my sock leftovers from over the years, and I tend to knit brightly colored socks), but I’m kind of OK with that. It’ll be a nice project to work on a little at a time, whenever my bowl of sock yarn leftovers gets too full. This entry was posted in Techniques and tagged afghan, blanket, Call the Midwife, Chummy, crochet, granny square, how-to, joining, scrap yarn, sock yarn, tutorial, TV, whip stitch, yarn on June 7, 2013 by onemilljellybeans. 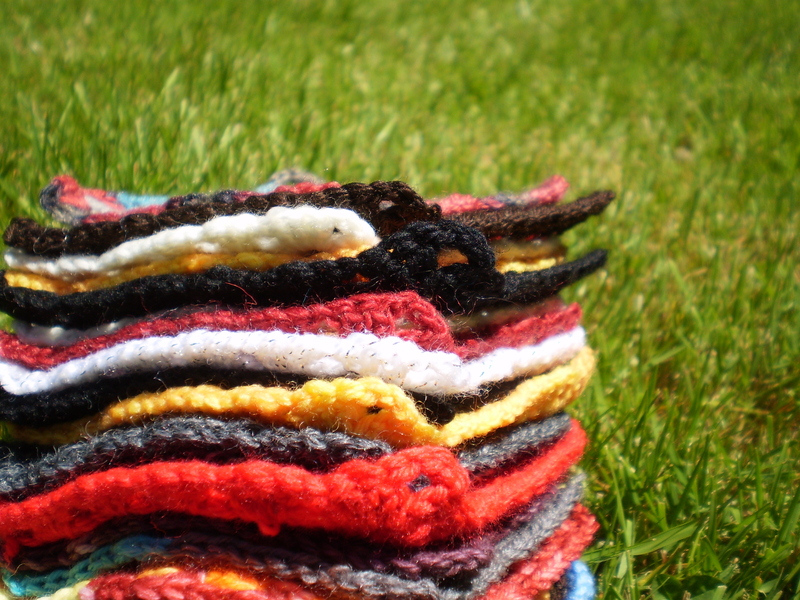 Want to make your own blanket like Chummy’s? 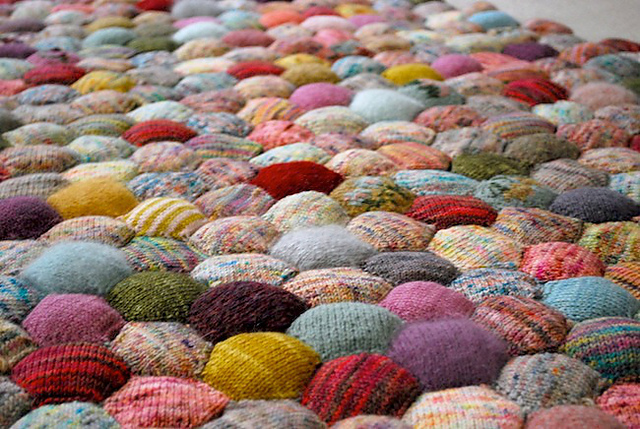 It’s super easy (and satisfying) to make granny squares from your scrap yarn. 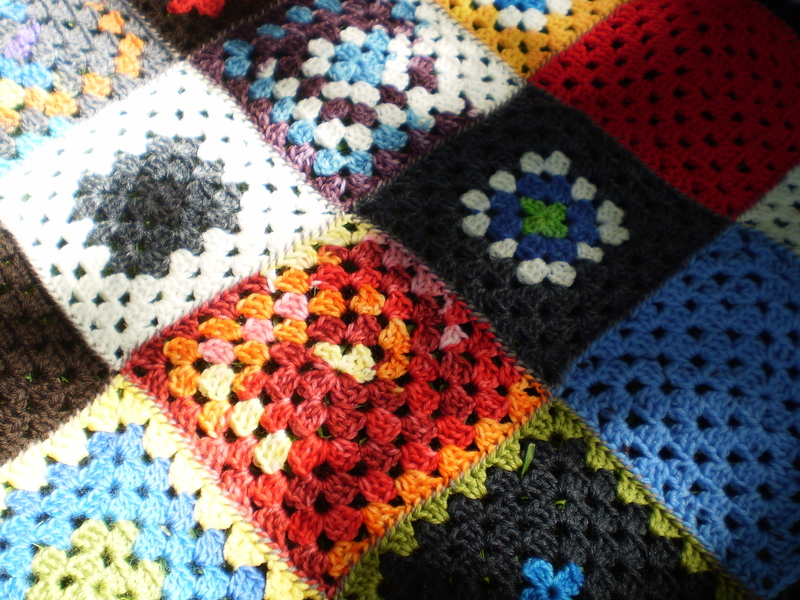 This entry was posted in Tutorial and tagged afghan, blanket, Call the Midwife, Chummy, crochet, granny square, how-to, scrap yarn, sock yarn, tutorial, TV, yarn on June 5, 2013 by onemilljellybeans.